Release 14, our 2019 release in the TAS Premier 7i series, is now available. 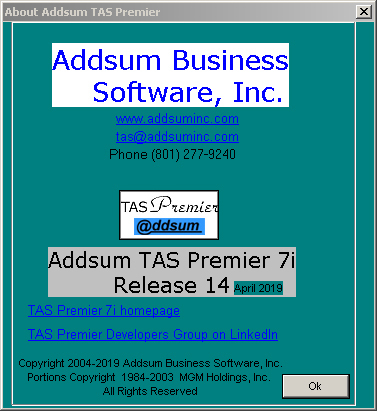 TAS Premier is a fully integrated 4GL programming language designed to work with either Btrieve (more modern versions referred to as Pervasive, PSQL, and/or Actian PSQL) data files or a highly performance optimized xBase derivative. It includes program, screen and report editors plus data dictionary utilities, data maintenance options, and more. More information. The first release of TAS Premier 7i was in 2005. Since then we have usually released an annual update related to cumulative improvements since the prior release. This release then marks now some 14 years of 7i series updates. 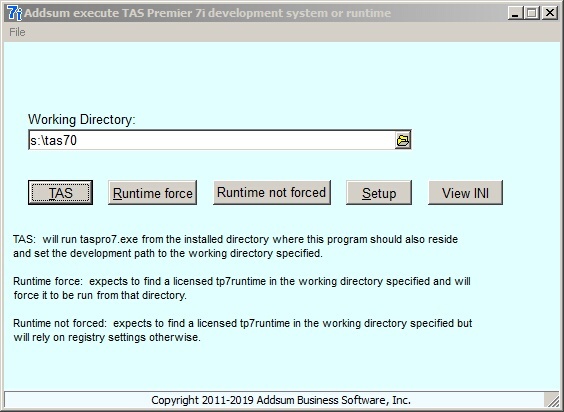 TAS Premier 7i was in turn based on our 2004 release of TAS Professional 7, building on prior versions released by Business Tools, Inc. including TAS Professional 6 (first released in 2001). Prior 16-bit versions of the TAS language evolved from Business Tools, Inc. products that date back to 1984. Release 14 is primarily a maintenance update but includes some important updates and enhancements. 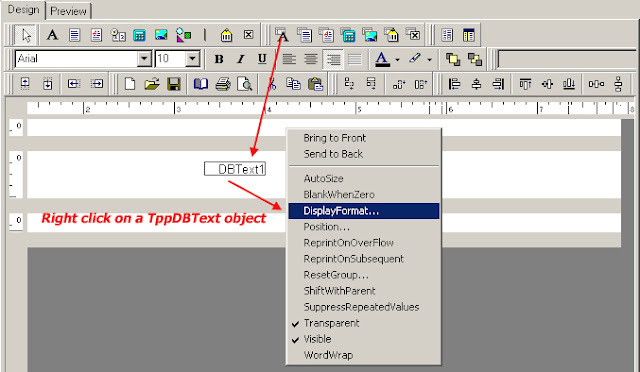 The report designer has long had a DisplayFormat option (when right clicking on report objects, most notably numeric objects) which is primarily convenient for end user use (the report designer is a separate executable and can be called from within a licensed runtime). 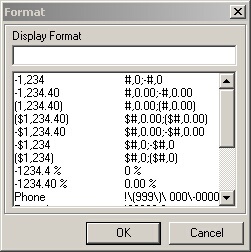 This option is now available, particularly for numeric format changes; the available numeric and some other formatting options are also displayed and can be selected via the list box (see image below). Simply click on the desired template (and optionally, manually edit it in the edit text box), click on OK, save the report layout, and then run the report program that uses it to see the results. The Encrypt File option now "remembers" the last file encrypted as well as the last encryption phase (in the same session and once they are entered the first time). If the file is successfully encrypted, it no longer provides a "success" confirmation but instead the modal form immediately closes. TP7EXECUTE.EXE has been enhanced and "Runtime" now has two options: force and not forced. "Not forced" works the same way as in the past; "forced" will force the runtime to run from the same directory specified and in essence overrides any registry settings (explanatory on-screen help also added); also, the MRU list of recently chosen directories is now also available under a File menu option that wasn't previously visible, and will remember up to 16 prior entered paths. For developers with multiple projects/folders, this program saves a significant amount of time, especially as it has now been enhanced. 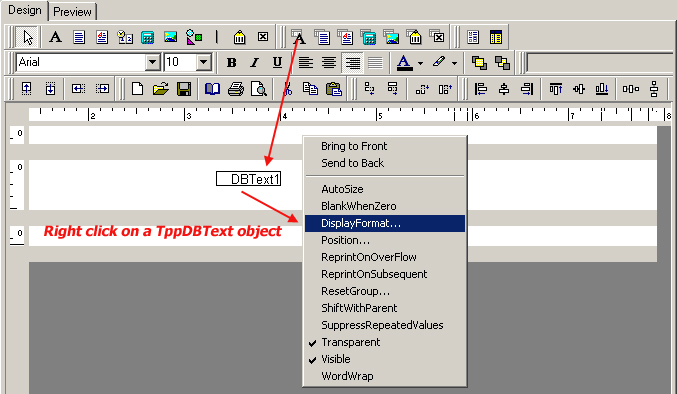 The Globally Change utility (Change/Delete Records - called from Utilities then Import File/Globally Change) has been significantly enhanced and now includes record locking support (both when changing and deleting records) and the ability to specify keys and ranges (similar to Export File and Quick Report) allowing for vastly improved data maintenance performance. Previously, regardless of the filter selected, both the change/modify and delete options required a scan of the entire file. That is now no longer the case. Other screen enhancements have been made as well. Other important changes/updates have also been made.